Meet Grenzlos, the Global Trekking Gnome, on the descent of one of his favorite peaks (he summited successfully and is actually completing a traverse of the mountain having ascended the ridge on the far right). He is obviously very full of the holiday spirit. Our challenge on our 2006 Holiday Greeting to our clients of the past 22 years was to identify the peak. Respondents had many very credible answers but only Tom Dempsey and Shirley House got it right. The rules of engagement in the contest were that the first person to identify the peak would receive a free night of lodging in the Alps during the summer of 2007. Tom got the answer in first but we can’t quite faithfully characterize him as a client as he is responsible for many of the images in our 2006 and 2007 catalogues (please visit Tom at www.photoseek.com). 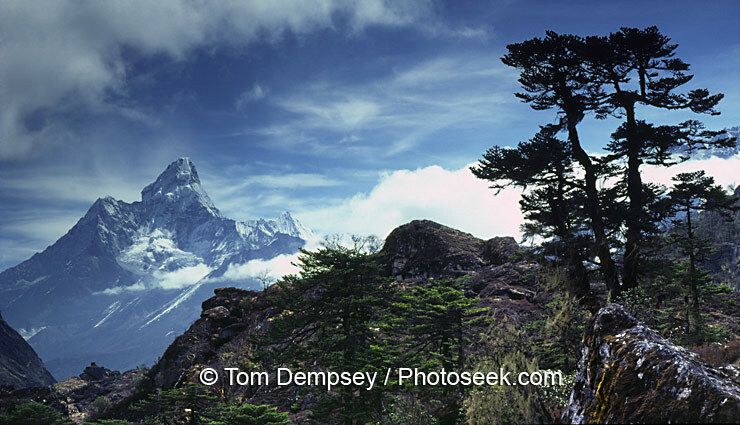 Here is one of Tom’s images of Ama Dablam, the correct answer to the contest. Shirley House also answered correctly. Shirley is a very popular person in the Ryder/Walker office and with the guide staff. Shirley has been on over 20 trips with Ryder/Walker and knows the Alps, and obviously other mountains of the world, intimately. Shirley recently trekked to the Everest base camp. 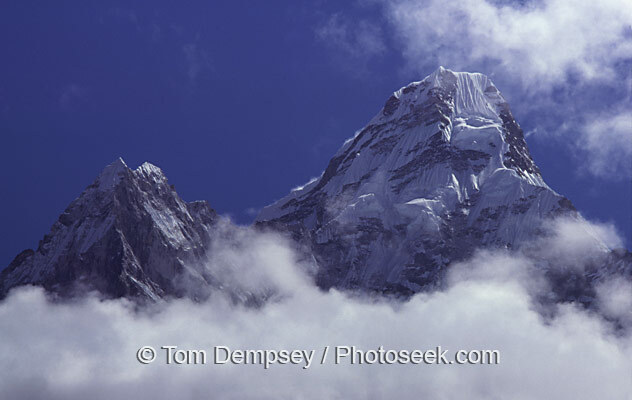 Ama Dablam happens to be on the way so she became well-acquainted with the peak. Ama Dablam is considered to be just shy of 22,500 feet. The name Ama Dablam is born from the beautiful hanging glacier on its SW side and means “mother and her pearl necklace”, the necklace is represented by the huge serac band that is the most stunning feature of this ice mass. 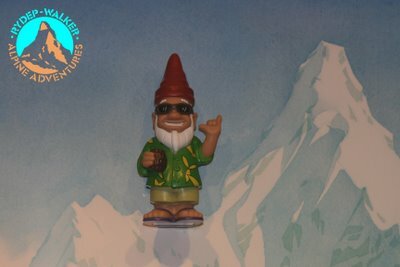 The image on our greeting card (minus Grenzlos, the global trekking gnome, of course) is from the gentle alpine artwork of Samivel. Samivel’s work is very much worth a websearch if you have the free time. You will be delighted by the fancy of his imagination, especially anyone enamoured of the Haute Savoie and Mont Blanc. Congratulations to Tom and Shirley, and Happy Holidays from the Ryder/Walker Team.